These Crisps were a little too thick to provide a crisp, crackle of a crunch. Instead the chomping experience featured a few crispy munches, but the Crisp quickly turned to potato mash. Although thin and crispy looking, these Crisps were a little more thickly cut than a lot of regular Crisps. There was an uneven and bubbly surface, with a few cracked boils. The seasoning was present, but it was muted and turned whatever shiny oily areas that existed into a matt finish. There was also some skin on edges. A Nose Plunge Test revealed a familiar Cheese & Onion aroma. It was not just Cheese, but although there was something else there, it could not be fairly described as Onion. The taste was a fair bit more rewarding. 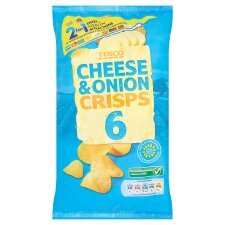 The Cheese was mild, the Onion was mild, but they both mixed up well with the potato to provide a balanced, if somewhat timid flavour.